Product prices and availability are accurate as of 2019-04-16 04:45:24 EDT and are subject to change. Any price and availability information displayed on http://www.amazon.com/ at the time of purchase will apply to the purchase of this product. 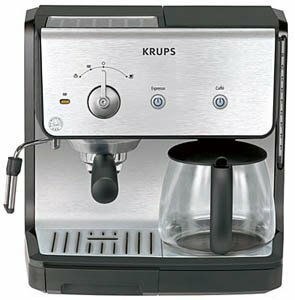 New from Krups, the XP2010 Combi Machine is a dual function espresso and drip coffee maker. This combination unit has a 10 cup coffee maker,15 bar pump espresso maker with a thermoblock heating element to ensure consistent water temperature every time. The 32oz removable water tank is large enough to brew 25 shots of espresso and the heavyweight die cast filter holder has 3 interchangeable sieves for 1 or 2 servings of ground espresso as well as ESE pre-portioned pods. Beautiful brushed stainless steel finish matches any kitchen decor.